Type 1 bottom-stacking PCIe/104 x4 Gen 2.0 interface. 20 gigabit per second burst transfer rate. 4.55 inch x 3.775 inch size (11.56 cm x 9.59 cm). PCI104e bus expands without a backplane or card cage. Four corner mounting holes: Resistant to shock and vibration. 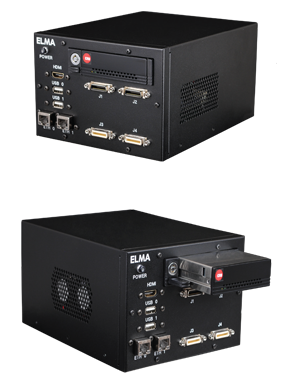 EIA RS-644 (LVDS) Drivers & Receivers support pixel clock frequencies up to 85 MHz. Supports camera's max resolution, frame rate, and bit depth. Four 26 pin MDR Camera Link connectors for up to four Base cameras or one or two 10 tap, Full, or Medium cameras. Two 10 pin headers for trigger inputs and strobe outputs. Supported by XCAP-Lite (no charge with board purchase), XCAP-Ltd, XCAP-Std, XCLIB, and XCLIBIPL. Compatible with 32-bit & 64-bit Windows 10, 8, 7, Vista, XP, 2000, LINUX, and 32-bit DOS. Also TWAIN and Image-Pro Compatible. Allied Vision Technologies Bonito CL-400 Monochrome or Color 2320×1726 400 fps 10-Bit CMOS 7 µ2 3.89 Mpixel Needs one PIXCI® e104x4 for half frame rate, two for full frame rate. Monochrome or Color 1280×1024 500 fps 8-Bit CMOS 12 µ2 1.25 Mpixel Global Shutter. Windowing for faster frame rate. Monochrome or Color 1280×1024 500 fps 8/10-Bit CMOS 14 µ2 1.25 Mpixel Global Shutter. ISO 2500 (Mono). Monochrome or Color 512×512 2300 fps 8-Bit CMOS 16 µ 2 0.25 Mpixel ISO 1650 (Mono). NAC HotShot 1280 CL Monochrome or Color 1280×1024 500 fps 8-Bit CMOS 12 µ2 1.25 Mpixel ISO 400 (Mono). Virtually ALL Full, Medium, & Base Camera Link Cameras Supports Camera's Maximum Resolution Supports Camera's Maximum Frame Rate Any Optimzed for camera link cameras listed in PIXCI Selection Guide . 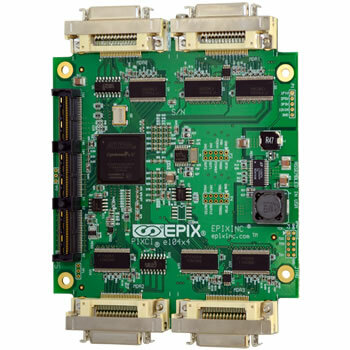 The chart lists high-performance cameras that showcase the PIXCI® e104x4 board's capability to transfer massive amounts of image data which translates into the ability to capture high resolutions at comparatively fast frame rates. The PIXCI® e104x4 is primarily designed to support high performance cameras, but it also works with virtually ALL camera link cameras. Please visit the PIXCI Selection Guide for a comprehensive listing of supported cameras.